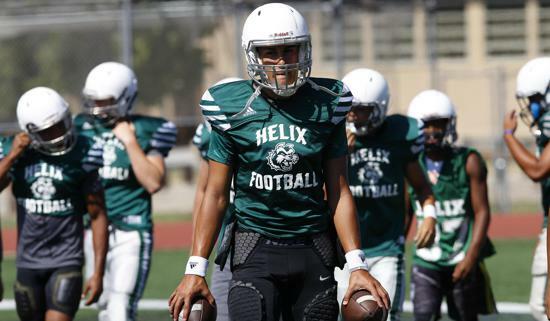 Helix quarterback Carson Baker is working to get the offense in gear. CHULA VISTA  While it may not be functioning on all cylinders, the Helix offense can still light up a scoreboard. The second-ranked Scotties showed that Friday night, getting a pair of touchdowns each from Ezekial Noa and Scott Young to down host Eastlake 42-7. Turnovers played a huge role starting the game. Helix’s (2-1) first two drives ended with turnovers. First the Titans’ Adrian Hernandez picked off a Carson Baker pass at the goal line to end Helix’s first possession. Their second possession lasted just one play when Eastlake’s Declan Fernandez recovered a fumble at the Titans 37-yard line with 6:49 left in the first quarter. With 2:28 left in the first quarter a mix-up in the Eastlake backfield allowed Young to recover the fumble in the end zone for a 7-0 Helix lead. Helix added first-half TDs on a 65-yard breakaway by Noa with 5:59 left and a 4-yard Baker-to-Young hook-up with 2:47 left. The Helix defense held Eastlake without a first down until the 1:30 mark of the half. They followed it up with quarterback Alfredo Garcia connecting with Jae Vitin for a 13-yard score to cap a 65-yard, 10-play drive. Helix added TD runs of 4 yards by Noa to open the third quarter, 2 yards by Dayon Reynolds with 2:25 in the third quarter and an 11-yard score by Mugan Blue late in the fourth quarter.